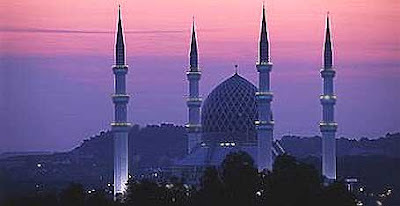 The Sultan Salahuddin Abdul Aziz Shah Mosque is located in Shah Alam, capital city of Selangor. The Sultan, who bears the same name as the mosque, decided to build this mosque after he moved the capital of Selangor to Shah Alam. The mosque was completed on March 11, 1988. Sultan Salahuddin Abdul Aziz Shah Mosque is one of the largest mosques in South-east Asia, and has the capacity to accommodate up to 24,000 worshippers at any one time. The four minarets which reach the height of 142m in the air are the tallest in the world, and the blue and silver dome 51.2m diameter wide and soars to a height of 106.7m above the ground is the largest religious dome. The mosque is hence nicked named the “Blue Mosque” for its blue aluminium dome covered in rosette of verses from the Quran, although it bears little resemblance to the Blue Mosque in Istanbul. Visitors should dress according to the Islamic dress code. Suitable attire is provided at the main entrance.